How’s your week going? Mine has been great so far. I’ve found out that a blog header I designed for a contest by Creating Keepsakes won! It will go up on their blog in June, there are 2 other winners so be sure to hop over to the CKblog to check them out! 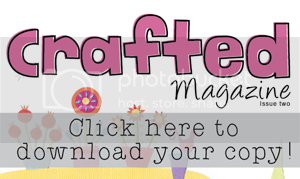 Yesterday, Dom from Crafted (one of my amazing sponsors) published the 2nd issue of Crafted Magazine. It is full of inspiration, artist features and tutorials. It also has a little article by me in there, so be you should most definitely go download the latest issue of Crafted Mag and be inspired! And the last little bit of news for you is that something exciting is coming to Punk Projects in April! From April 1st to April 22nd (Earth day!) Punk Projects will be full of eco friendly inspiration and recycled tutorials! I have a lot of tutorials already lined up, and I am going to have some fantastic guest bloggers! April is going to have so many inspiring posts, you’ll love it! Do you have any exciting news?? Let me know, I would love to hear what you’ve been up to. I heart green crafts! Yay! Congrats about the blog header! A HUGE congrats on the blogh header! 🙂 🙂 You totally deserve it! The one you made is just so bright and cheery!